Farm Shows & Events | Soil Service, Inc. I am a lousy photographer! But here are two pictures of the newest Renegade VT that the guys at our warehouse have just finished getting ready to go out. We have put a lot of thought and design to get true vertical tillage in a machine which is not only versatile, but also simple to adjust and use. We were able to get a Renegade VT down to Missouri last fall for some limited field work and where we did run it, the results were fantastic! We had some more demos and rental acres for it to run, but Mother Nature kept us out of the field. There are some videos of the machine running in various locations, posted on our YOU TUBE Channel that you can view( https://www.youtube.com/channel/UCyOcLaBN1fbjw4Pf72E8D0A ). There is also a video from Machinery Pete of Brent talking about the Renegade VT. Check them out. We have had the Renegade VT at least one indoor farm show last fall, and interest was incredible! Plans are to have a machine at the Iowa Power Show later this month. We are still trying to get space at the National Farm Machinery Show in Louisville in February, but currently it doesn’t look like that is going to be possible. Same for the Western Farm Show in Kansas City. If you are looking for a new vertical tillage machine, come to our booth at any of the farm shows coming up this winter. We answer any of your questions, explain why the Renegade VT is true vertical tillage, and how it can help your operation. Harvest started out great this year. Around here we started the second week of September (which seems like an eternity ago) then the cold and rains hit. Since the rain, it has been a struggle to get the crops out, but from meeting and talking to several farmers, it seems they are happy with the corn and bean yields, just wish price was better. We combined our corn plots last Friday, October 19, and yields were good. We do not have all our information put together yet, but the plots seemed to do very well. SOIL Service Inc. is going to hold a tillage/agronomy day November 13 starting at 9:30 a.m. At this event we are going to demonstrate our NEW Renegade VT tillage tool along with some other tillage methods, then we will have a lunch and go over our plot results. 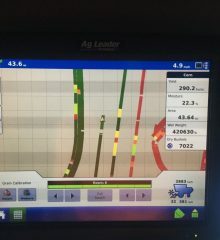 Harvest is underway in Missouri, and early results are coming in (as seen in the above screen shot). Even though we have been under extreme drought conditions here, it looks like the corn yields are going to be pretty good. This early report came from John Hansman in Central Missouri. You might remember that name from last year. I followed John’s soybeans from planting through harvest. This year he used the entire Soil Service Program, from starter at planting and foliar feeding with Foliar Opp. Even with the extreme stress that we have experienced in this part of the country, this shows that using a “balanced” fertility program from start to finish in a crop helps the plants deal with extreme stress and be able to finish strong. By the way, John reported that it looked like he was averaging about 162 bushels per acre in this field. Thanks for the report, John! Next week, September 11 thro 13, we will be at Husker Harvest Days in Nebraska. This will be my very first HHD, and I am looking forward to seeing this farm show. If you are planning to attend, please stop by the Soil Service, Inc. booth (#761) and visit with us about our Crop Choice fertility program to help you get the most out of your crop in 2019. To say that it has been dry in my state, is an understatement! Today we are getting a bit of rain, and more is in the forecast for tonight and tomorrow. It is going to take 8 to 10 inches to get us back to normal and “bust” this year’s drought. Hope that it doesn’t all come at once! One of our customers called last week with a success story. He had gotten some Max 72 SRN and Sugar E-Boost to fly on his corn with the fungicide application back in July. Evidently, his neighbor had also flown on some fungicide (with out Max 72) across the road. The neighbor’s corn was having standability problems. 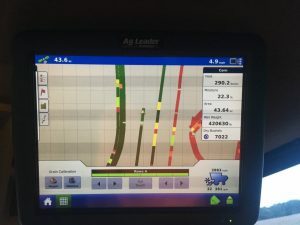 Our customer’s corn was standing almost perfectly, he was proud of it and is making plans for his aerial app next season, with more Max 72 and Sugar E-Boost! One of the attributes of applying fungicide is better stress management by keeping the plant healthy for better late season standability. Getting the fungicide translocated throughout the entire plant is the key. Using SOIL SERVICE, INC. products (Soil Boost Plus, LandOil, Sugar E-Boost, Max 72 SRN) with the aerial application will enhance the effectiveness of the fungicide. In this case, it has really showed up. If you are in an area where there has been some stress on you corn this season, and did, or didn’t apply a fungicide, get out and check on the stalk quality. You may want to get that combine out just a little sooner this year. Don’t forget that the Farm Progress Show is coming in just two weeks. If you are planning on coming, our booth # is 757, we’ve moved, and there will be a whole new look to our booth. Stop and see us and ask about Max 72 SRN, aerial application, and all our other products. Hope to see you there! I have had the pleasure of working for Brent and Andrea at Soil Service since August in billing. I have met and work with a lot of great people. So many of them I have just gotten to know through phone calls. Well, last week I got to meet some of our distributors at the Iowa Power Farm Show in Des Moines in person. What a great group of guys!! Very knowledgeable and so easy to talk to. Give us a call to find out which distributor, salesman, or dealer can cover your needs in your area.